EFAs are added or used by all ages for health reasons due to extensive evidence. 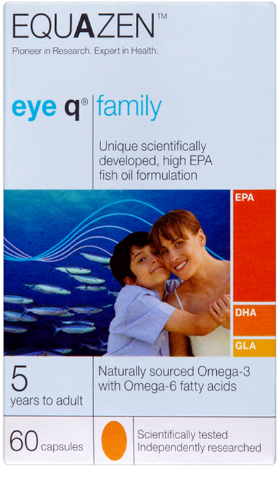 Mainly we hear about the importance of EFAs for healthy brain and eye development in regards to children but Omega 3 and 6 are essential fatty acids that are essential to the whole body. What dosage has been used in the Cherab Foundation since 2000 with thousands of families? I will use the following examples with the brand name NNProEFA 3.6.9. since that’s the formula/dosage that seems to work the best for most of us (Efalex and EyeQ are similar Omega 3/6 formulas that also have good reports) For any brand name of Omega 3/6 formula -you could make the same formula by mixing together fish oil (EPA, DHA) and just a few drops of either primrose or borage seed oil (GLA). Keep in mind in anecdotal feedback done by parents from all over through CHERAB -that pure Omega 3 (including cod liver oil) or pure Omega 6 either showed no results -or very little results in almost all cases. If wanting to use a pure Omega 3 the best reports were from higher EPA formulas like Coromega -but again with the small amount of GLA better results were reported. GLA may reduce inflammation to help the EPA and DHA cross the blood brain barrier. Some studies even suggest that GLA protects DNA. The formula of one (regular not Jr.) capsule a day NNProEFA 3.6.9. using US testing standards which have worked well for the majority as a basic formula for children of all ages. 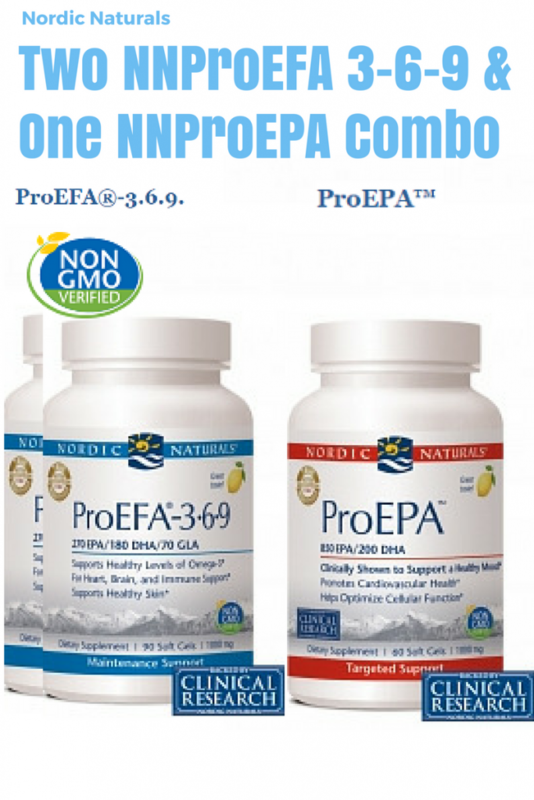 The formula I discovered that is even better for apraxia and autism is raising the EPA slightly higher, 1 capsule of NN ProEPA contains 425 mg EPA and 100 mg DHA. 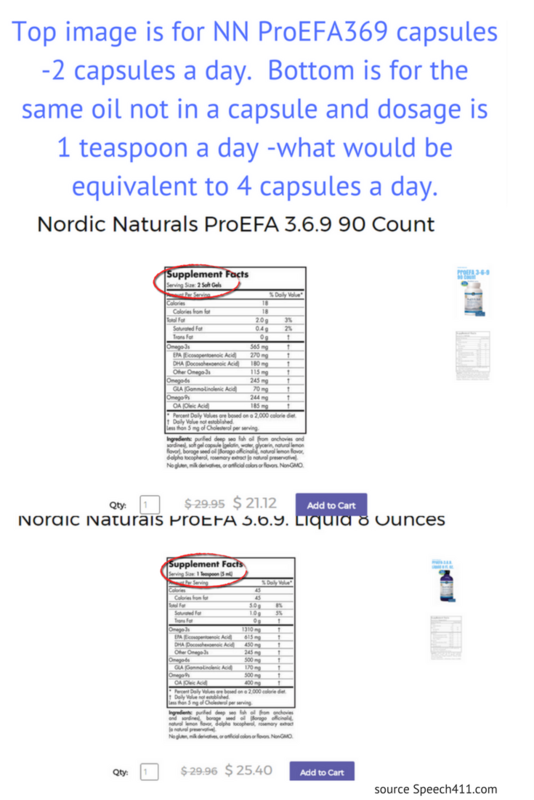 A comparable formula to Nordic Naturals (NN) ProEFA 369 or NN ProEPA and because EyeQ is manufactured in the UK will be easier and cheaper to purchase. If using EyeQ the recommended dosage is 6 capsules a day. When it comes to fish oils brand name isn’t important, all that matters are formula, dosage and quality of the oils. 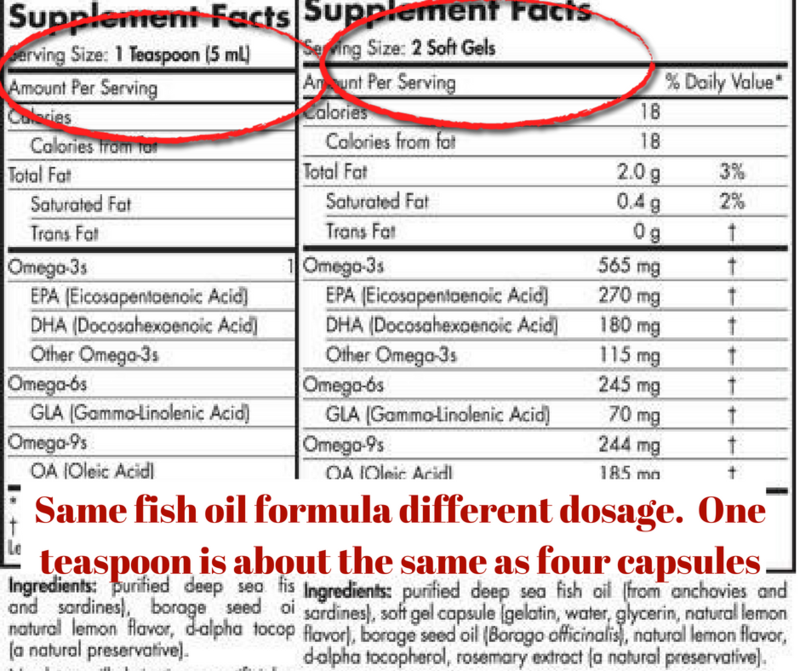 For the person that says they are using or tried using “fish oil” that may or may not be the right formula. What has worked best in our nonprofit for thousands now over a decade is a formula higher in EPA than DHA with a small amount of GLA. Two brands that fit these criteria would be NNProEFA 3.6.9. by Nordic Naturals manufactured in the US and Eye Q by Equazen manufactured in the UK. Nordic Naturals makes a number of oils and they have a number of lines including a health care professional and a commercial line. NNComplete Omega is the commercial line sold in stores which is the exact same formula as the professional line called NNProEFA 3.6.9. sold by health care professionals. NNProEFA 3.6.9. in the professional line is slightly cheaper as you get 90 capsules per bottle vs. 60 for around the same price of the NNComplete Omega in the commercial line. Through the years the formula that has worked discovered by Lisa Geng in 2001 is combining NNProEFA 3.6.9. with another formula by Nordic called NNProEPA to raise the EPA even more. For apraxia the ratio is 2 capsules of NNProEFA 3.6.9. to one capsule of NNProEPA. This has been the formula that has worked best for thousands in over a decade. Please read on to see research on reasons for a specific Omega 3 AND Omega 6 formula. You can look at the amounts of EPA, DHA and GLA and recreate the same or similar formula just about anywhere. My bottle of fish oil says just one capsule a day. Isn’t that the dosage? Efalex which is a fish oil formula developed by Dr. Jacky Stordy and which has been used in research -the dosage is “Two capsule two to four times daily with food or drink. Taking this product for the first time: Adults and children older than five years, 8 capsules daily with food or drink for the first 12 weeks.” My son Tanner started on Efalex but as it’s low in EPA, we as a group found the NNProEFA 3.6.9. to be a better formula. You can, however, read my son Tanner’s initial updates when first on Efalex here as published in the book The LCP Solution written by Dr. J. Stordy. 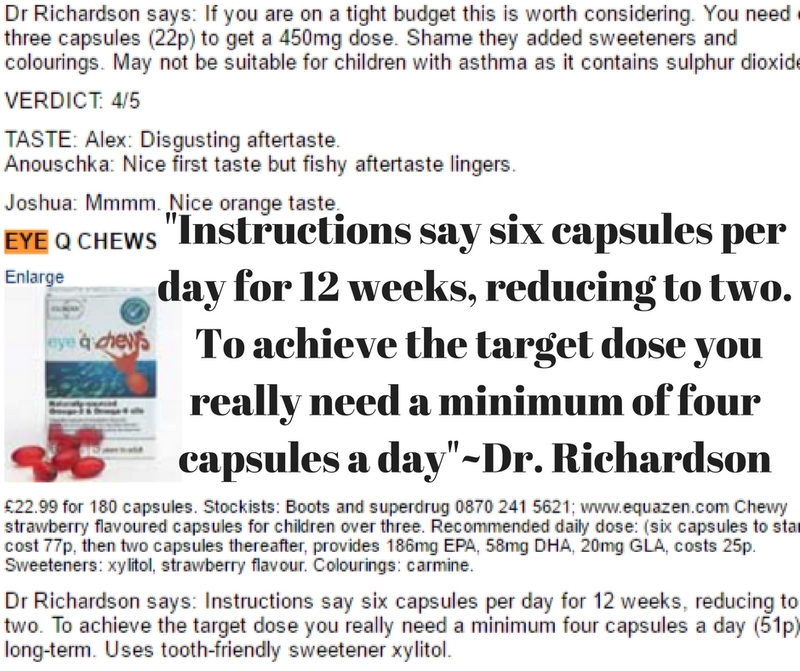 My son’s section is called “The Lellow Breakthrough” And Dr. Richardson who presented at the First Apraxia Conference was asked about dosage for this article and as you can see she’s recommending at least 3 times over what would be on most bottles. While most capsules of fish oil will only say “one capsule a day” or “two capsules a day” unless that formula had been used in a study, on fish oil liquid even if it’s the exact same formula you’ll notice that the dosage of the exact same formula will be one teaspoon a day. One teaspoon of fish oil will be equivalent to around four regular sized capsules of the same fish oil. Confusing? Frustrating? Doesn’t make sense…no wonder fish oil is good for apraxia! In addition to what I shared about our nonprofit experience, researched Efalex and the dosage used on that label, as you can see from this article which was written with an interview with Dr. AJ Richardson (one of the doctors who presented at our First Apraxia Conference as you’ll see below) who looks at fish oil brands marketed to children, in just about every case the dosage Dr. Richardson recommends is about three times higher than what is on the product label. What is the best way to increase EFAs in my child and where do I get them? There are many ways to increase the amount of essential fatty acids in you or your child’s diet. You can for one increase the amount of fish. Today in addition to fish, again you can also serve your child algae with the new formula by Nordic Naturals called Algae Omega which contains both EPA and DHA and has no smell or taste. If you are going to give your child fish oils, make sure it’s a reputable brand that verifies their product’s purity in writing. When it comes to fish oils brand name isn’t important, all that matters are the formula, dosage, and quality of the oils. For the person that says they are using or tried using “fish oil” that may or may not be the right formula. What has worked best in our nonprofit for thousands now over a decade is a formula higher in EPA than DHA with a small amount of GLA. Two brands that fit these criteria would be NNProEFA 3.6.9. by Nordic Naturals manufactured in the US and Eye Q by Equazen manufactured in the UK. Nordic Naturals makes a number of oils and they have a number of lines including a health care professional and a commercial line. NNComplete Omega is the commercial line sold in stores which is the exact same formula as the professional line called NNProEFA 3.6.9. sold by health care professionals. NNProEFA 3.6.9. in the professional line is slightly cheaper as you get 90 capsules per bottle vs. 60 for around the same price of the NNComplete Omega in the commercial line. Even if you do purchase a formula that doesn’t contain any GLA from primrose or borage seed oil, seek one that is higher in EPA to DHA such as Coromega -but again with the small amount of GLA better results were reported in the majority of our group for over a decade now. My child is allergic to shellfish. Can I still give him fish oil? My child is allergic to fish. Can I still give him fish oil? Nordic Naturals states “In theory, fish proteins should be effectively removed in processing. However, it is certainly possible for fish oils to have small traces of protein. The fish gelatin that is used in our fish gelatin Omega-3 formula, however, is derived from fish protein, and could be considered allergenic.” You could use the oil that is not in a capsule in that case but again check with your child’s doctor. If your child is allergic to fish you can add flax or chia seed to their diet which contains Omega 3s. The only thing to keep in mind is that while flax or chia are an excellent source of the essential omega-3 alpha-linolenic acid (ALA or LNA) which is the quintessential parent member of the omega-3 family of essential fatty acids (EFAs). The body transforms it into EPA and the EPA into DHA. This transformation is very inefficient (the yield is about 10%) and is further inhibited by over consumption of omega-6 fatty acids from most vegetable oils or certain disease states. Therefore, if there are no allergies it is advisable to independently consume also ready made EPA and DHA from good quality fish or from high-quality fish oil supplements, and algae would be a good alternative too. Can I Give My Infant Fish Oils? “The question is can EFAs be supplemented to younger children so that verbal apraxia/dyspraxia can be prevented? The simple theoretical answer to this is a yes. The U.S. Food and Drug Administration approved the addition of 100 mg/day of DHA (Docosahexaenoic, an omega-3 EFA) and 100 mg/day of ARA (arachidonic acid, an omega-6 EFA) that is produced from GLA to infant formula. The purpose is to make infant formulas more like breast milk. So, giving the content of one ProEFA to an eight months old would provide about the same amount of DHA and half the ALA. Since some of the linoleic acid from the borage oil will be transformed by the body into ALA, the total ALA will be close to the 100 mg/day dose. The 140 mg of EPA will be welcomed by the body. Recommendation: Since these are over the counter nutritional supplements the decision as to undertake this preventive pathway or not is ultimately yours. Nevertheless, please contact your pediatrician and share this information with him/her..” ~Robert Katz, Ph. D.
This is very helpful. I am still trying to figure out how much to give my 2, almost 3 year old for apraxia. We have the Nordic Naturals Pro Omega liquid fish oil. 1450 EPA/1060 DHA. I Think I should give him 1/2 teaspoon a day?? You could use a quarter of a teaspoon to start which would be around the same as 2 regular sized capsules of ProEFA- but lacking in the GLA. Have you noticed anything since you started? Hello, my son does not have apraxia, he has ADHD. Will this formula of the 2 NN ProEFA 369 with 1 NN ProEP be appropriate for his as well? I have looked into the EyeQ priduct for him before, but really like NN products. Thanks you in advance. My son is 7.5 with apraxia and autism. We currently have him on the ProEFA liquid 3-6-9 by Nordic Naturals. He takes 5 ml once a day which has 610 EPA/405 DHA/170 GLA . We have seen improvements but was thinking he could benefit from more EPA. Do you have any suggestions? I kind of think it’s better to reduce the dosage and use the half teaspoon and just add the one NN ProEPA to that because it shocks most people that they are using less fish oils and seeing more progress. For most when it comes to fish oils it’s not about amount -it’s about formula. Not like that with everything -but for fish oil that appears to be the norm. Let me know! My son is 5yrs old non verbal ASD. I just orders the combo, is ok to start with the 2:1? Hi Catherine, I typically recommend starting with the one capsule of NN ProEFA 369 for a few days just to make sure your child isn’t allergic to anything in the formula. But I know 2 year olds who were started on the combo (3 capsules) and raised to 9 capsules. In 17 years don’t know of any side effects with regular fish oils -too much of any oil they may get the runs -but in research even for kids they typically use 2 teaspoons a day (about the same as 8 capsules) and historically generations of kids were given a tablespoon of cod liver oil a day. As always if not sure -check with his ped! I have a 4 year old with a mild speech issue. He doesn’t qualify for speech therapy services through the school district but I want to see if fish oil will help with articulation and he has some ADHD like symptoms too. The health food store near me only sells NN Complete Omega Jr. My question is, should I give the recommended 1/2 teaspoon as the label says or what do you recommend for complete omega jr? I’d like to try your formula but not sure if it’s the same as what I have and I’m unsure about dosage. My son is 29 months. Just dignosis with apraxia and expressive language delay. I tried the baby dha oil one. However my son hate it. I think it is because there is no flavor at all. Then I get him the omega E fishies. As you said, this is much expensive. What would suggest if I finish the fishies, should I go for 2 Pro EFA and 1 pro EPA for him. I don’t believe he can swallow any capsules yet. If I squeeze the oil out from the capsules, will it taste different from the liquid version? Which one will taste better? Thanks. I have one more question. I know pro EFA is the same as complete omega. How’s about Pro EPA? Is it the same as EPA commercial line? If it is complete omega and EPA, what formula would be the best? About the fish oils -the “jr” as I cover is just a marketing thing -it’s the exact same fish oil but literally about twice as expensive. If you are piercing the capsules and squeezing out the oil it won’t make a difference what the capsule size it and if anything a larger capsule will be easier. I would just buy one bottle of the NNProEFA 369 and try to get that in first -and then you can add the NNProEPA. Let me know how it goes! If I keep giving the omega fishies to my son, I saw that the passage said 1 fishies= 1 capsule of NNProEFA 369. If this case, should I give 2 fishes per day. Hi lisa. My name is ayu from malaysia. It was a good thing to finally found your website about fish oil.my son was diagnosed with SPD at 22months. I already purchase nordic natural for babies with 350 mg EPA and 485 mg DHA. Nordic natural is not available in my place. I bought it from US. Can u please explain more. I am a bit confuse. I thought the baby fish oil liquid is sufficient for my child. Thank u in advance. Hi Ayu! There is no such thing as dosage for a baby or child set that I know of. Fish oils are essential for all ages and even in utero. Some fish oil formulas though are marketed to children with flavoring or capsule size. This is the main page for fish oils https://pursuitofresearch.org/2010/12/01/therapeutic-use-of-fish-oil-for-apraxia-autism-and-other-communication-impairments/ See what formulas are in stores near you and compare dosages of EPA, DHA and if possible one that also has GLA. If you aren’t sure let me know what brands are available to you. If nothing else though you can order online from anywhere. Tq Lisa for your reply. In my country, I found fish oil with brand name bio life, seven seas ,,blackmore, nature’s way, Kordell’s. Nordic naturals that available here are complete omega, ultimate omega, complete omega junior, kids, and babies. But, I found that no GLA inside for babies type. Please advise me. Hi Ayu, Bio life I couldn’t find anything with an Omega 3/6 blend. Seven Seas has a cod liver oil with evening primrose oil but they have a crazy site that has some disclaimer and won’t let me view the page (found on Amazon and it’s about 70 dollars- that’s crazy expensive for fish oil (especially cod liver oil which is the cheapest) and need to know amounts of DHA, EPA, and GLA. Then I saw you have Nordic naturals in the stores near you! My son is 4 years old, 41 pounds. He has been diagnosed with developmental delay–for now. We go back every 3 months to watch for Autism. Apraxia is also a possibility. His main problem is expressive and receptive language. I would like to order the PROEFA liquid but have some concerns. Do you think I could mix this liquid into anything like juice or applesauce? Also, the PROEFA liquid is all I would have to purchase, correct? It has everything I need in it? As for dosage, I am going to start him out with 1/2 a tsp just to make sure there are not any allergy issues. Then increase to 1tsp, does this sound okay? Sorry for all the questions, I just want to make sure I get this right. We are desperate to help him. You can start with one capsule of ProEFA 369 which would be about the same as a quarter of a teaspoon of liquid. On this page https://pursuitofresearch.org/2016/09/13/dosage-of-fish-oil-for-children/ you’ll see I recommend once you get to 2 capsules (or about half a teaspoon) of NN ProEFA 369 I recommend adding in one capsule of NN ProEPA instead of increasing the NN ProEFA 369 You can try both as most of us do -but the overwhelming majority found that to be an even better formula. Also, in addition to that really long paragraph above (lol) he knows his ABCs, colors, shapes, numbers, and all that stuff. When I mentioned hand flapping above, it is never a situation where he kind of zones out into his own world. When he hand flaps its usually over being excited and he totally is looking at you and engaged. He makes eye contact, he loves being around kids and adults, doesnt want to play off by himself, knows when to say please, thank you, all that. His pretend play is great, and he is very loving. He is not potty trained, that has been a tough one so far. He has a lot of trouble sharing, but he is an only child so that doesnt help, and hes pretty stubborn lol. I feel like i may be rambling but I just want to get it all out so you can understand more of whats going on. Do you think that he could benefit from taking the fish oils?? I just want to be able to converse with my son in this lifetime. I hope we can get there. Im sorry if I sound ungrateful. Believe me, I know it could be worse. Its just such an emotional situation when it comes to your child. Hi Jasmine, we have exactly the same situation, how is your child now? Thank you for your very well-researched, informative post. When increasing, is the ratio always 2:1 (2 NN EFA Pro gels and 1 EPA gel)? We increase every few days to reach 9 gels total as indicated in research for 12 days. Is the 9 total =6 EFA and 3 EFA, divided doses? Also, do you start the 12 days once you reach optimal dose? My child is 2.5 (speech delay, sensory) and 7 (autism, managed recovery). I appreciate your insight. Thank you. As far as your question “is the ratio always 2:1” for most that appears to be the best formula but by raising one capsule at a time you’ll be the best judge for your child. I recommend always raising the NN ProEFA 369 first as I personally found you don’t want the NN ProEPA to be too high for autism and apraxia. Depends though on the child. While the NN ProEFA 369 is great even alone, it’s pretty rare for the NN ProEPA to be great alone for autism and apraxia. Depends on the diagnosis- for ADHD either formula is good -but I found the 1 to 1 ratio is best. Again you’ll be your child’s best judge. My son is 2 years old and has dysarthria after a stroke at 7 weeks old. He has difficulty controlling his tongue and lips. I’m interested in trying him on fish oil. Am I right in thinking that if I get the nordic naturals 3-6-9 he would take two of those capsules and one eda? Hello, we will be starting my nonverbal 2.5 year old with 2 ProEFA and 1 ProEPA, he is diagnosed with Global Developmental Delays and his ST is thinking apraxia as he is nonverbal and seems to try and make words but has trouble actually saying them. When do you recommend increasing the dosage? And should it be given all at once? Hi Diane, You can start with one capsule of NN ProEFA 369- even with just that one capsule you should note a change in a day to three weeks. Let me know. I typically recommend starting with a very low amount for 2 reasons -one because it’s freaking crazy how just a tiny squirt of fish oil makes a difference, and 2, and probably should put this first -just to make sure your child isn’t allergic to fish oils which appears to be extremely rare as I don’t believe we know anyone yet who’s child was allergic to fish- or maybe the parents already knew and so never tried fish oil? Anyway -good to go starting with the 1 capsule -then go to 2 of the NN ProEFA 369. Use your judgement -years ago we used to raise whenever we saw a plateau which is around 3 to 6 months-ish. Then add the one capsule of the NN proEPA to the 2 capsules of the NN ProEFA 369 -that used to be 6 months to a year later. But as you pointed out in your question today many start with all three -2 capsules of NN ProEFA 369 and the one capsule of NN ProEPA. Excited for you -please come back and update! You don’t mention your child’s diagnosis, does he have one? I would recommend if autism or apraxia that you use 2 of the NN ProEFA 369 (which is the same as half a teaspoon of liquid as you are using the commercial formula of the same name) to one capsule of NN ProEPA. You may want to compare the professional line which you can get from a healthcare provider or online at sites like http://www.speech411.com to the commercial line you buy in the store as they are typically around the same, but you get more capsules/product with the professional line. Why I recommend the “pro” line. The commercial line though is great for instant gratification or when you run out. How do you get your child to take the oil? Would the dosage increase with a 17 yr old, 120 lbs? Thanks! 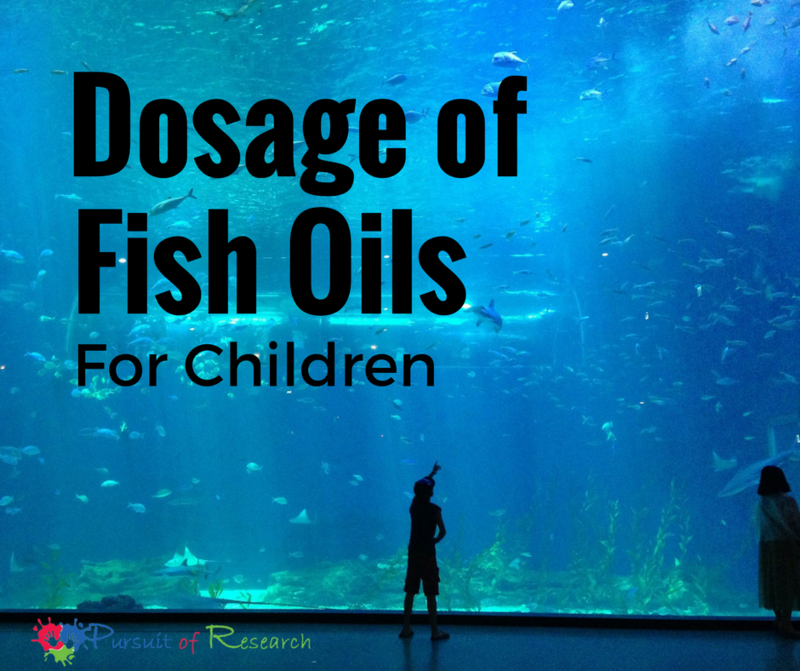 As I have on this page https://pursuitofresearch.org/2016/09/13/dosage-of-fish-oil-for-children/ the dosage in children is typically around 2 teaspoons (8 capsules) a day, higher in adults- maybe 12 to 16 capsules a day? But most including myself don’t even use 8 capsules ongoing- perhaps early on at some point when they first started. But not even to start as I started both my boys on just one capsule and worked up. Hello Lisa, I have a almost 4 yrs old boy. Yet to be evaluated. He is non verbal. He is making sounds, (da, na,ga, la,ne, etc). But no words. He has some signs of autism or apraxia. We don t know just yet. We are getting him evaluated soon. He was born premature. 32 weeks. No health issues what so ever. We are giving him children’s DHS from Nordic naturals (3ml for 3 months). In form of liquid in his worm milk. But no results. We come across this Web site and we found a lot of good info. And we want to thank you for all that you do. But also to ask you what do you think would be best to give him? For example should we give him NN PRO EFA 369 alone? Or NN pRO EFA369 Pluss PRO EPA, together? And what would be a good dosage? Thank you in advance! Has he been for a speech and hearing evaluation yet? Here are some ways to secure free or low cost therapy https://pursuitofresearch.org/2016/05/31/5-ways-to-get-free-or-affordable-speech-therapy/ By 4 years old he should have a diagnosis, so if the professionals working with him don’t know, I’d find new ones to work with. In addition to an SLP since apraxia or autism is suspected, I would recommend an evaluation by either a pediatric neurologist or developmental pediatrician to confirm or rule out soft signs https://pursuitofresearch.org/2014/07/29/parent-friendly-soft-signs/ You want an accurate diagnosis so you can advocate for appropriate therapy. We are giving him children’s DHA from Nordic naturals (3ml for 3 months). Hi, I have a 2 year old (26 month old) who is non verbal. He has asd/spd (we are in the process of getting the official diagnosis) I started him on Nordic naturals children’s dha liquid 2 weeks ago he has half a teaspoon. Right now the most important thing you can do is confirm that the ASD is an accurate diagnosis. It’s kind of difficult to tell the difference for example between ASD and apraxia, and if he has SPD, he may have that with another speech issue and can appear like he’s on the spectrum. If autism or apraxia are diagnosed or suspected by an SLP it’s highly recommended to take him to either a pediatric neurologist or developmental pediatrician to confirm or rule out the soft signs https://pursuitofresearch.org/2014/07/29/parent-friendly-soft-signs/ Does he fit signs of apraxia? http://www.cherabfoundation.org/2006/parent-friendly-signs-of-verbal-apraxia/ Verbal apraxia is typically not diagnosed until 3, but oral apraxia can be diagnosed earlier https://pursuitofresearch.org/2017/02/03/why-more-should-know-what-oral-apraxia-is/ Not all that have verbal apraxia though will also have oral apraxia. Fish oils can be confusing, but just know they are not all the same formula -even though they may all stink if you spill them. Hi Lisa, thanks so many much for your reply. My son is showing some of the soft signs for apraxia, we have an appt with our development paedetrician coming up so I’m going to ask them about it. Hello Lisa. My 19-month old has a 22% speech delay. He does not qualify for the state’s early intervention program, so I am considering signing him up for private speech therapy. Also, I have been giving him to two capsules of NN 3-6-9 for about 2 months but I have not seen much improvement. I am therefore considering adding 1 NNProEPA. Has this combination of 2:1 been given to children under 2? I just wonder if I should wait until he turns 2 to give him that extra capsule. My 4 year old has developmental verbal dyspraxia (apraxia in the US!). After reading your advice on here I have started giving him omega supplements. I am in the UK so have bought Equazen chews – they have 186mg EPA, 58mg DHA & 20 mg GLA per 2 chews. I have started giving him 4 chews per day, i think the ratio is alright but is this dosage (372mg, 116mg, 40mg) too low? Just to confirm – if I was continuing with the chews, how many would you recommend/ what dosage? Hi again Trevor, first let me know if you noticed anything with the 2 capsules. That’s similar to one capsule of the NN ProEFA 369 and while from research and feedback most appear to be what we call ‘responders’ not all are. Really confusing as packaging talks about per dose, which is 2x chews. So long term, 4x chews which is 372mg EPA, 116mg DHA & 40 mg GLA is sufficient? Or you mean 4 “doses” which is actually 8 chews? I’m so glad to have found this site. The SLP said my 3 yr old son could have apraxia and I would like to try this EPA and EFA. I’m planning to give just 1 EFA for the first time. I just want to know how long before I switch him to 2:1 ratio. Also what effect would I expect after his 1st use? Hope to hear from you soon. I now we as parents are all about instant gratification but if your child has a speech impairment and especially apraxia- anything that helps accelerates the progress- in a week -that’s mind blowing! You may want to join our support group at http://www.apraxia.org as your question come up frequently there and we have a number of members who are special education attorneys and teachers- as well as moms like me who have learned how to advocate. This page https://pursuitofresearch.org/2013/03/22/speech-therapy-matrix/ has some basic information on how to help you get started in advocacy (see the links under the matrix too) and this page https://pursuitofresearch.org/2016/05/31/5-ways-to-get-free-or-affordable-speech-therapy/ will help you in securing free or low-cost therapy -including through insurance. There is so much hope, and so many ways to secure the therapies your child is entitled to! I have both of the bottles NNProEFA 369 and NNProEPA. My daughter just turned 2 years old but she is only about 16-17lbs. Would the dose of 2 NN ProEFA 369 with 1 NN ProEPA be good for her as well or should I give a lower dose? If so what should I start with? 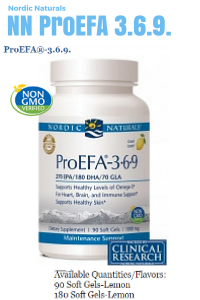 One regular sized capsule of NN ProEFA 369 is about equivalant to the dosage of EFAs the FDA approved for infant formula. 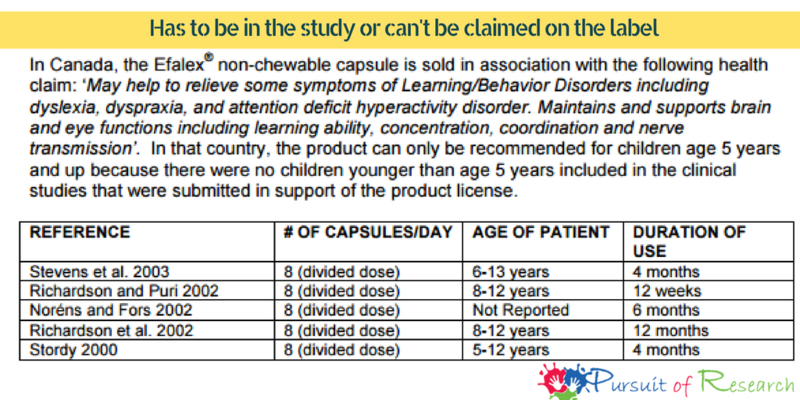 So a capsule or two of NN ProEFA 369 is considered “highly conservative” by all the experts who presented at our first apraxia conference https://pursuitofresearch.org/2016/09/12/the-first-scientific-conference-on-therapy-for-verbal-apraxiadyspraxia/ As I have on this page https://pursuitofresearch.org/2016/09/13/dosage-of-fish-oil-for-children/ the typical dosage used in research for children is around 2 teaspoons a day which is around 8 capsules. My 12 yo son though not diagnosed with adhd has been very disruptive & running around in class. He gets angry easily. I have been giving him GNC dha 250mg (dha250+100epa) once a day before going to school. Its not showing any results. I’m tired of getting complaints from the teachers. Also his PSLE is just 5 months away. Please recommend the dosage & product best suited for him. I would order soon. I desperately need your advise on this. Thanking you in advance. My older son Dakota was diagnosed with both ADHD and CAPD and I found it’s not the DHA as much as the EPA that is key for him -and appears to be that way for others that have ADHD too. Most of the nonprofit I run deals with communication impairments so while ADHD is common it’s not the main thing we talk about- but I highly recommend before giving up on fish oils to try a formula higher in EPA. I have a lot of information on this page https://pursuitofresearch.org/2013/03/15/diet-may-help-adhd-more-than-drugs/ Fish oils in higher dosages kept my son off medications -and in general there are studies that found diet may help ADHD better than drugs as I have linked to on that page. For fish oils the formula I found best for ADHD was a one to one ratio of the NN ProEFA 369 and NN ProEPA -at one point before using a nutritional powder that is high in amino acids too my son was on 10 capsules a day at one point (under his doctor’s supervision) So way higher dosages than most would use. We got there over time. He’s 21 today graduated with a bachelor’s degree in game design 3D animation from SCAD in only 2 years because he completed his associates in HS and got hired out of school at an excellent job. He takes his fish oil and nutritional powder – and now so does his girlfriend too! I know how tough it can be- but there are sometimes answers outside of drugs. That includes not only nutrition but strategies in the IEP. Does he have an IEP yet? If not I highly recommend getting him classified so you can secure help for him that way too. Hello! I have two children with Smith-Lemli-Opitz Syndrome ( a rare genetic syndrome which inhibits their bodies’ ability to produce or metabolize cholesterol). Both children have developmental delays including speech. My son is 10 and is more greatly affected than my 5 yo daughter. He can swallow pills with no problem, but she would need chewables or gummies. What products and dosages would you recommend for each child? Thank you! Casey being your children have a difficulty in metabolizing certain nutrients I’d seek the advice of your children’s pediatrician. You may want to seek medical doctors who are also knowledgeable about nutrition as not all are. 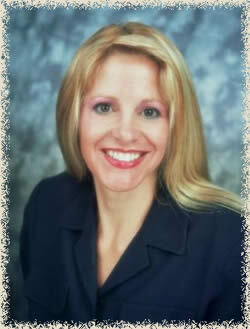 For example, I have been working on a nutritional product with a pediatrician who has a large special needs client base and who was trained under Dr. Weil for integrative medication (you can see her background on this page https://getiqed.com/pages/meet-our-team ) I can also put you in touch with this mom Jody https://oneinamillionkid.wordpress.com/ who’s now adult daughter Sophie has severe gut issues. Everything she does with Soph is overseen by a team of doctors in Chicago- she is very knowledgeable as a mom and is connected to a group on facebook filled with parents that have children with rare and complex disorders (how we met originally) contact me through this website and I’ll introduce you via email. Based on their condition, I wouldn’t be comfortable personally recommending anything to you that wasn’t approved by your children’s doctors -but I do believe there is both help and hope through nutrition. And yes now it’s just finding out what! My son is 24 months old with a speech delay. I bought the Nordic Naturals Baby DHA the other day. Will this work or should I go and get the ProEFA? No point letting the baby DHA go to waste -you can use it -and regardless it will be healthy. The children’s DHA is strawberry flavored cod liver oil. If you use a fish oil from the liver of the fish you’ll also be serving your child vitamin A and D which you may or may not want to do. You certainly have to be aware of higher dosages with cod liver oil as fat soluble vitamins add up in the body. A fish oil not made from the liver of the fish doesn’t contain vitamins A and D (you’ll know if the fish oil does as it will be on the nutritional label) Also as I have on this page https://pursuitofresearch.org/2016/09/13/dosage-of-fish-oil-for-children/ we found formulas higher in EPA to DHA (Omega 3s) with a bit of the Omega 6 GLA to be better. So yes I’d recommend using the NN ProEFA 369 if looking for therapeutic use of fish oils. Please update! Perfect! It may appear the dosages are only about the same, but you have to look at the capsule size, the serving suggestion on each bottle- I assure you the NN ProEFA 369 and the NN Complete Omega are the exact same formula and oil. Just packaged and marketed differently The commercial line your husband purchased is great for instant gratification or when you run out. The professional line is what most of us use when our children are responders because it’s cheaper. You’ll get typically a third more capsule for the same amount of money as the commercial line. You should know within a day to 3 weeks if your child is a responder! My daughter is 27 months old (who weighs 23 lbs). She is non-verbal and has the following diagnosis: 3p25.3 de novo micro deletion, global developmental delays, Dyskinetic Cerebral Palsy, Sensory Processing Disorder and Autism. Due to her oral motor issues, she still drinks out of a bottle and only eat puree food. I was giving her Honest Company’s Baby DHA since the day she was born but I want to switch to higher end fish oil. I also bought a bottle of Carlson The Very Finest Fish Oil Liquid Omega-3 Lemon per a doctor’s suggestion but haven’t started her on it. When searching for NN ProEFA 369 or NN ProEPA it is highly recommended to make sure you are purchasing from an authorized distributor. Nordic Naturals price sets and doesn’t provide anyone with deep discounts. They are also very critical about quality. I was informed by Nordic Naturals in their professional division that there are some people selling Nordic Naturals fish oils on Amazon that contain cotton. Nordic Naturals does not pack their bottles with cotton. Nordic Naturals does not authorize any distributors on Amazon or eBay. My son is 4 years old. He has been diagnosed with ASD. He knows his ABCs, colors, shapes, numbers, and all that stuff. He has poor eye contact, he loves being around kids and adults. He knows when to say thank you. His pretend play is great, and he is very loving. He is not potty trained. He has a lot of trouble sharing, but he is an only child so that doesnt help, and hes pretty stubborn. As for dosage, I started with 5ml with NN Omega Complete Liquid but changed it to 2.5ml after I read your article and it has been a month now. Now I am thinking to increase the dosage to NN Omega Complete Liquid 2.5ml + 1 NN EPA Xtra capsule to squeeze (all commercial range). Is that ok? Or should I look for 1 NN EPA only? My son is 22 months and we suspect has apraxia. He currently receives speech due to expressive language delays (he has a few sounds and a few words but Elma is his go to word for everything and he doesn’t imitate sounds or mouth movements). I’d like to start with the nn proefa 3,6,9, but is he too young to start. Or should he be 2 and above? Hi Lisa.My girl is 3 and was diagnosed with ASD. Can I know if its alright to give her 1 capsule of the Complete Omega Junior per day? The bottle stated that it is only for kids above 5 years. Thanks. Many of the bottles of fish oils have dosage information that has to fit within the FTC guidelines but they contradict each other, or contradict similar formulas of fish oils that have been used in research as I explain on the page above. One regular (not jr) sized capsule of NN ProEFA 369 is about equivalent to the dosage the FDA approved for infant formula. On the Jr sized capsules (which have been discontinued in the professional line) the dosage is “2 capsules a day” which is the same as 1 regular sized capsule since each capsule is a half dosage. But go look at the bottle of the NN Complete Omega Jr liquid -and the dosage is 1 teaspoon (or 5ml) a day which is the same as around 4 regular or 8 jr sized capsules. If you look at fish oils used in research in pediatrics the dosage is typically around 2 teaspoons a day- or around 6 to 9 capsules (regular sized) a day. I have a 4 year old with a mild speech issue. He inverts words in his sentences, which turns out to make no sense. He has trouble remembering words when he wants to speak out, he puts in words that make no sense or changes the subject because he cant continue an idea verbally. He has been on speech therapy services for 2 years, and has improved with articulation significantly, however it seems he lacks of memory or vocabulary to make large sentences or describe events. He also has some ADHD like symptoms too. I’d like to try your formula but I’m unsure about dosage. I bought the NN-PROEFA 369 in liquid lemon flavor. I would really appreciate your help. Use up the liquid though make sure it’s refrigerated. You may want to seek a second opinion on what is the official diagnosis your child has, because by 4 years old it’s probably no longer a developmental delay. Getting to the root may alleviate any frustration being misunderstood is creating. Frustrations can appear in numerous ways in a child.